ASVIN is the first school we supported and we still do. 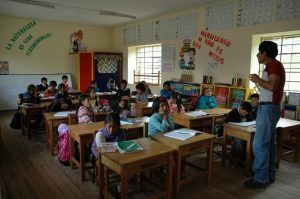 The school was created in 2007 to stop child labour in the Pillao Matao neighbourhood. We created the free canteen in 2009 to encourage parents to send their children to school. We built a new building in 2010 and doubled the capacity to 8 classes, created a library and a training workshop for mothers and teenagers. Discover the school in pictures. 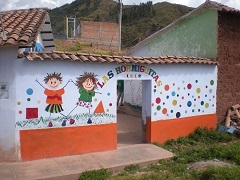 This school has been built by the inhabitants of the community. We helped to create a fourth class in 2016. 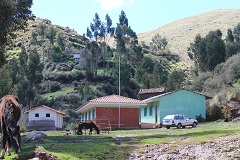 Not long ago, the school was situated in the countryside, close to Cusco. Now it is located on the edge of the city. Children in Picol come from families who left the countryside of Paucartambo to find work in the city. Parents and children learn to cope with urban habits. The Huchuy Yachaq association is situated in the Hermanos Ayar neighbourhood. The inhabitants and Marlene, a street educator, created the association to offer pupils a place of resource and education. Since 2007, a nursery, a kindergarten, a library, art and homework workshops, and a workshop for parents allow families to envisage a better future for their children. More information in the Cusco Express 69 dedicated to Huchuy Yachaq. Discover this place in pictures. 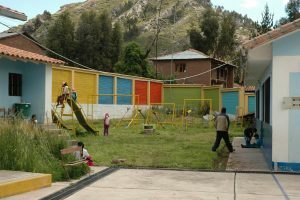 Located midway between Cusco and Titicaca lake, in an isolated area at 12960 ft, this project of school has been directed by Marlene (the founder of Huchuy Yachaq). Thanks to the dormitory, 12 pupils can go to school without having to walk long way each day. In 2017, in partnership with the organisation Les Catalans du désert, we financed in part the dormitory and the kitchen where diners and breakfasts are cooked. In the isolated hamlet of Mayubamba, the school allows children to attend school without having to walk for miles each day. Life up there is punctuated by agriculture. Thanks to the school, the children of Mayubamba will hopefully have a better future. 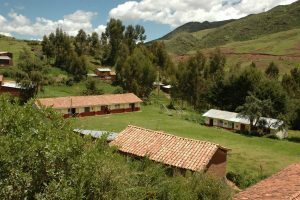 Kindergarten and primary teachers stay in the village for the week and go back to Cusco for the weekend. This school is lost in the mountains at the end of a long road. It can be reached after 1h30 of track from Cusco. Families live from little farming or a few sheep. Children arrive from various mountain trails after 1 or 2 hours walking. Moms take turns preparing hot chocolate over a wood fire. A teacher makes the way every day. In cases of heavy rain, it is impossible for the teacher to get to school. In this school we find farmers’ children. 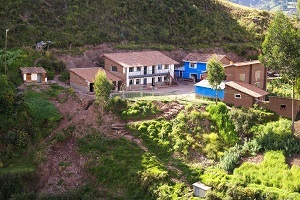 The small hamlet is located about at 1h30 of track of Cusco. During the day, the inhabitants leave the hamlet because the inhabitants go even higher with their small herds of llamas, alpacas or sheep. These persons live like their ancestors. The future of their children depends entirely on the contribution of the school. 3 teachers provide classes from kindergarten to 6th grade.